Lymphoedema is a collection of lymphatic fluid (clear fluid that circulates around the body tissues) that builds up in the tissues below the skin and causes swelling to the affected area. It will occur when the drainage routes of lymphatic fluid become blocked due to cancer or its treatments e.g. surgery, radiotherapy, tumour and trauma. Although lymphoedema cannot be cured, your individual management programme, as discussed and agreed with your Lymphoedema Nurse Specialist, can help to control and reduce your lymphoedema. People with lymphoedema have a high risk of developing an infection due to their impaired lymphatic system. One of the most common infections is called cellulitis which will appear in your affected area. Flu-like symptoms such as high temperature, headaches. You will need to see your GP immediately to assess if antibiotics are required. 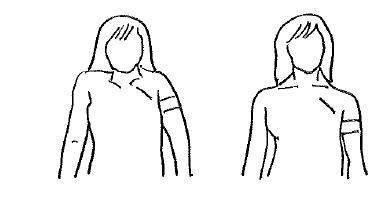 Until symptoms have improved, it will be necessary to remove your compression garment (see below) and rest your arm. Please inform your Lymphoedema Nurse Specialist after you have seen your GP. Avoid breaks in the skin, for example wear gardening gloves, insect repellant to prevent insect bites, household rubber gloves when washing. Use a non perfumed moisture cream to keep your skin supple and in good condition. Apply the cream daily, best done at night after your bath/shower. Apply cream in an upwards direction, starting at the top of the arm, finishing at the hand/fingers. Smooth down the hairs on the arm so that they lie naturally flat. 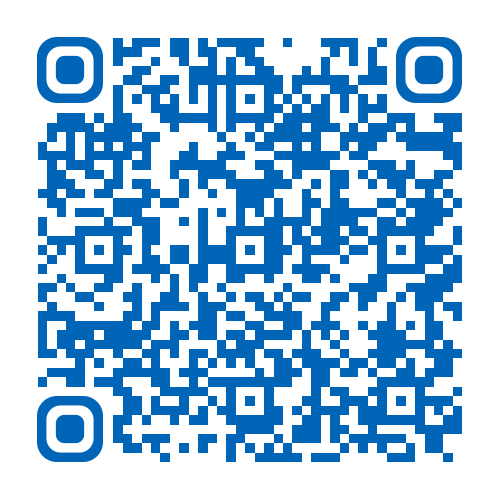 Inspect your skin daily, looking for signs of broken areas, redness and swelling. Pay particular attention to hands and fingers. Protect the skin on the arm from sunburn. Use an electric razor when shaving the armpit. After hand washing, dry well and moisturise. Take care when cutting finger nails as cuts from nail scissors may become infected. It is best to use nail clippers. Do not offer the affected arm for blood pressure readings, injections or the taking of blood. Do not take very hot baths, as this can make the swelling worse. Do not wear restrictive clothing, including tight underwear. When relaxing, rest the arm on a cushion. Please ensure you are wearing your compression garment when exercising if you have been supplied with one. Exercises will help to drain the fluid out of the swollen area. The muscles squeeze and relax as they work, which in turn helps to pump the fluid away. The pumping action is made more effective when you are wearing your compression garment as this will provide a gentle squeeze around the outside of the limb. Exercise will help to keep the joints moving and in good condition. Exercise will help to improve posture. Avoid using your limb in one position for a long time. Avoid over-exertion, do not strain and do not be over-vigorous. Avoid lifting, carrying, pushing, or pulling heavy weights. Do all exercises twice daily. Age and fitness will affect the amount/type of exercise you will be advised to do by your Lymphoedema Nurse Specialist. The exercises can be done either sitting down or standing. If the exercises cause you pain or dizziness, discontinue until you have contacted your Lymphoedema Nurse Specialist. If you have cellulitis you should rest your affected limb and carry out very gentle movement, e.g. 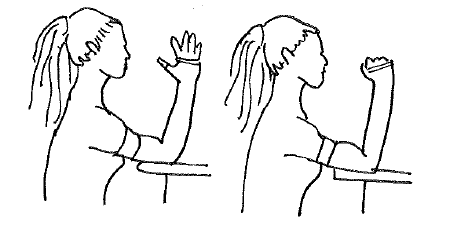 bending of the wrist and elbow. Try to exercise every day; swimming, walking and yoga are good forms of exercise. Avoid carrying heavy bags/handbags on your swollen arm. Exercising your arm whilst carrying out normal day to day activities will help your swelling. Carry out any exercise/activity in moderation (little and often). Exercises should be gentle, keeping the joints moving and in good condition (shoulder, elbow, wrist and fingers). Each exercise should be repeated 5 times, increasing to 10-15 times twice a day. 1. Shrug your shoulders up and down. 2. 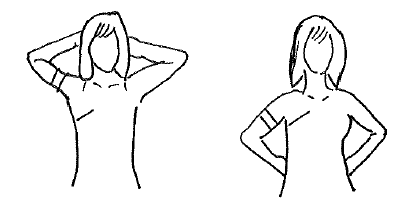 Circle your shoulders forward and then backwards. 3. Place your hands on your shoulders and lift your elbows out as far as they will comfortably go. Now circle your elbows 5 times forward and 5 times backwards. 4. 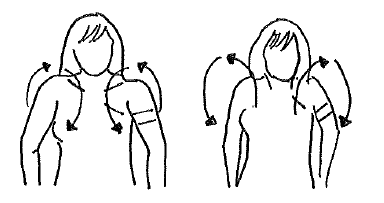 If you have full range of movement in your shoulder, make a rainbow shape with your arm; or do the breast stroke movement. 5. Place your hands behind your head, stretching your elbows apart. Then bring your arms down slowly, placing them behind your waist. 6. 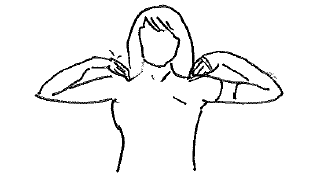 Bend your arm at the elbow and then straighten it slowly. 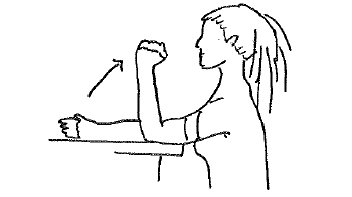 If your arm is heavy, support it by resting the elbow on a flat surface. 7. 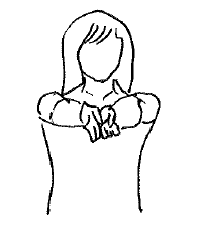 Rest your arm on a chair, bending your hand at the wrist, lift upwards, and then bend towards the floor. 8. 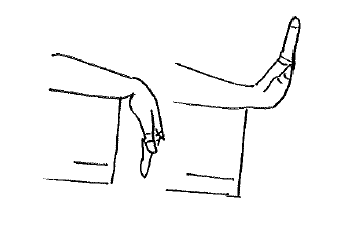 Supporting your elbow, spread out your fingers. Hold for 5 seconds and then make a fist. Pictures are owned by the Department. A compression garment is worn to help keep your swelling under control. It is best to put your garment on first thing in the morning. If you have any problems with applying your garment, please let your Lymphoedema Nurse Specialist know so that he/she can supply you with an aid for fitting and removing. Care should be taken not to snag or catch your garment with sharp nails or jewellery, etc. The fabric of the garment should be gradually eased up the limb to ensure even distribution. Ensure there are no creases or wrinkles since this will chafe the skin and act like an elastic band, causing fluid to build up. The garment should not be too tight. It should feel firm and supportive, but should not be painful or make the fingers turn a purple/blue colour. Ensure the garment is not too loose or baggy, especially nearer the hand; otherwise it will not do its job. If the compression garment feels too long just ease the excess material evenly down the limb. Never roll the tops of the garment down as this will act like an elastic band, causing fluid to build up lower down. All compression garments should be removed when retiring to bed at night, unless your Lymphoedema Nurse Specialist has advised otherwise. If you experience pins and needles, loss of sensation anywhere in the limb that you have not experienced before, an increase in pain or if your fingers turn blue, you should remove your garment immediately and inform your Lymphoedema Nurse Specialist. The use of rubber gloves is recommended when applying your garment as they enable you to smooth out wrinkles and grip the fabric. Garments should be replaced at least every 4-6 months as per the manufacturer’s guidelines. The Lymphoedema Support Network (LSN) is a patient led website and can be used as an additional source of information: www.lymphoedema.org. The name of your lymphoedema nurse specialist is: ___________________________________________________.